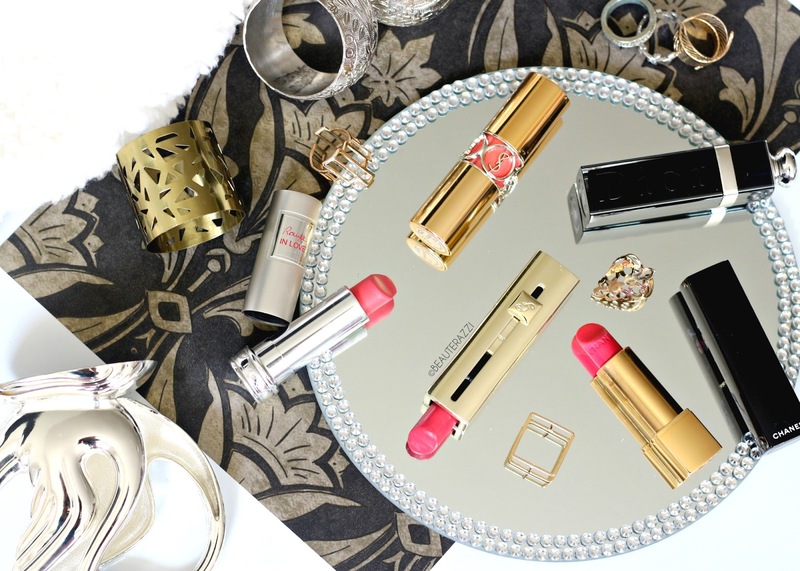 Now and then, I love splurging on luxury makeup. They just feel so..luxurious, right? 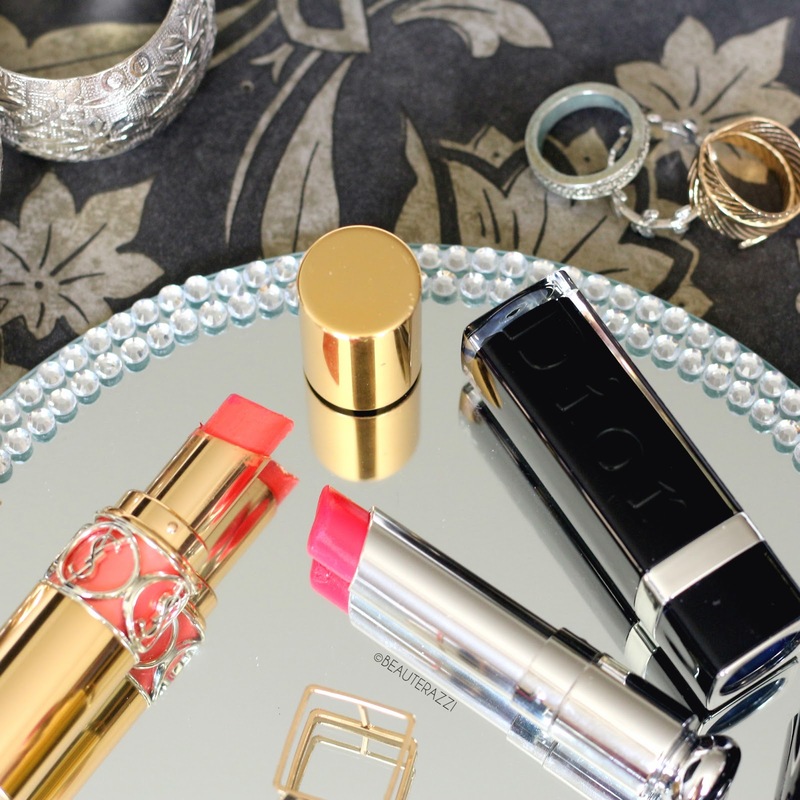 From the extravagant packaging to the rich formulas, mostly everything is on point. 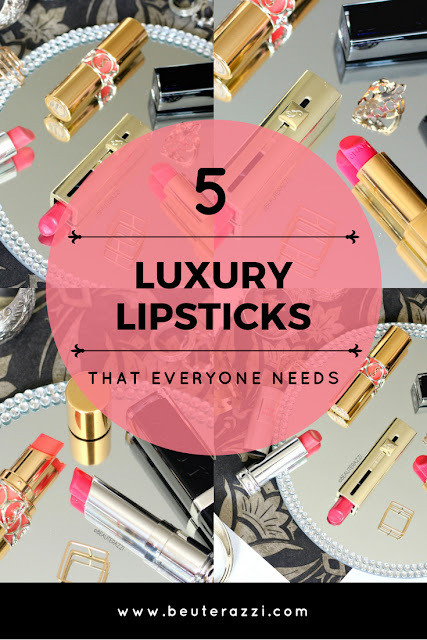 And today it's all about these high-end lipsticks; 5 lipsticks that I think everyone should definitely indulge in when they are feeling a little spendy. This has to be hands-down my favourite lipstick ever, EVER! 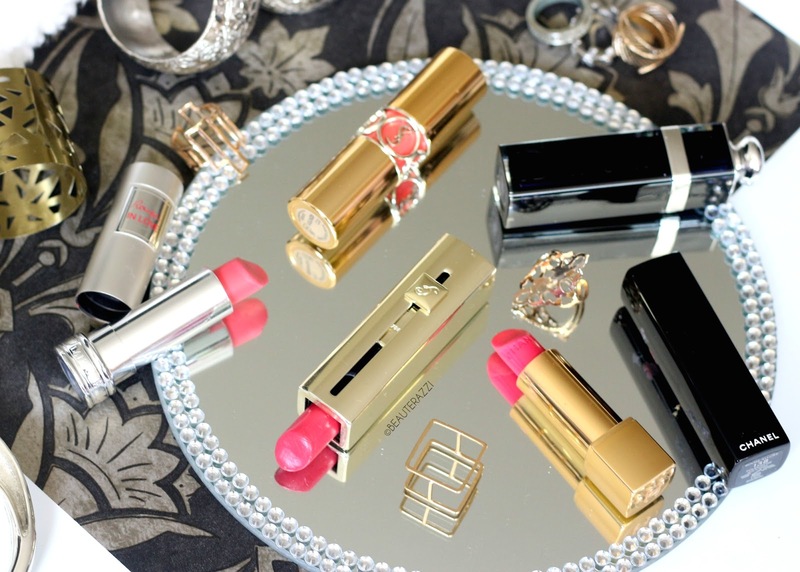 And if out of all these options you have to choose one, then do try any from the YSL Rouge Volupte range. Just look at that stunning gold tube mannn! Corail in Touch is a sheer, glossy, orange-coral which looks insanely beautiful. The formula is so hydrating that it feels like I am wearing a lip balm. I also mentioned it in my Winter Makeup Favourites a while back. 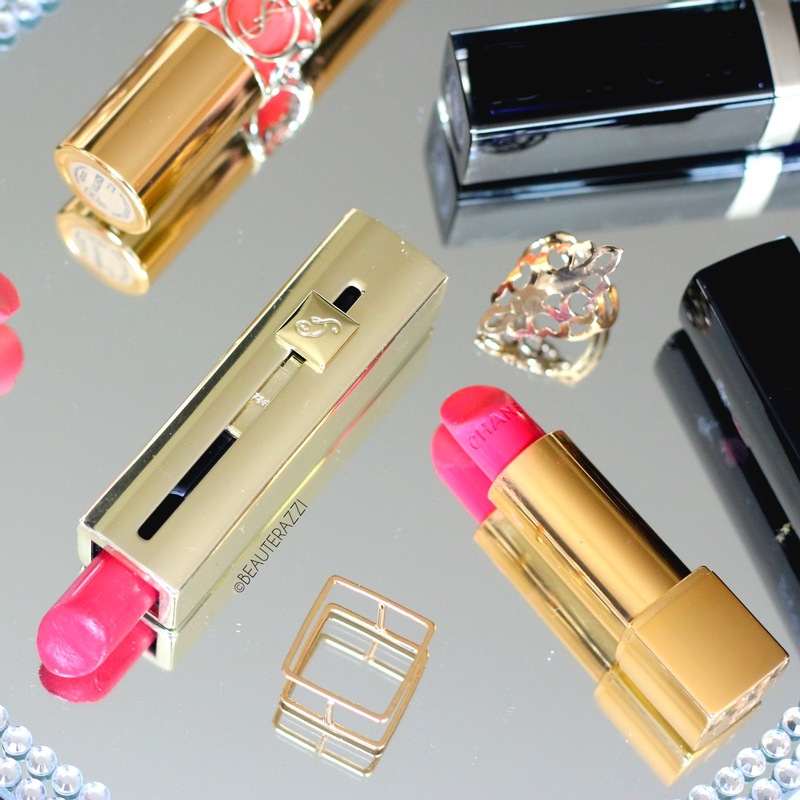 First of all, I must say the packaging of the Dior Extreme Addict Lipstick is so fancy. You can find more pictures in my review here. The formula is like that of a lip butter, very balmy and hydrating. Lucky is a bright rosy-pink which has a lustre finish. It is pigmented but not very opaque. Lancome Rouge In Love was my first luxury lipstick purchase. Corail in Love is a subtle, everyday peachy-pink with a cream finish. Usually I do not prefer light-coloured lipsticks but I love this one. It is just so flattering. Again the formula is very moisturising and comfortable. You can also read my full review here! Aah definitely one of my favourite pinks ever! Chanel Rouge Allure Lipstick in Fougueuse is a luminous, vibrant bubblegum pink, perfect for spring/summer. 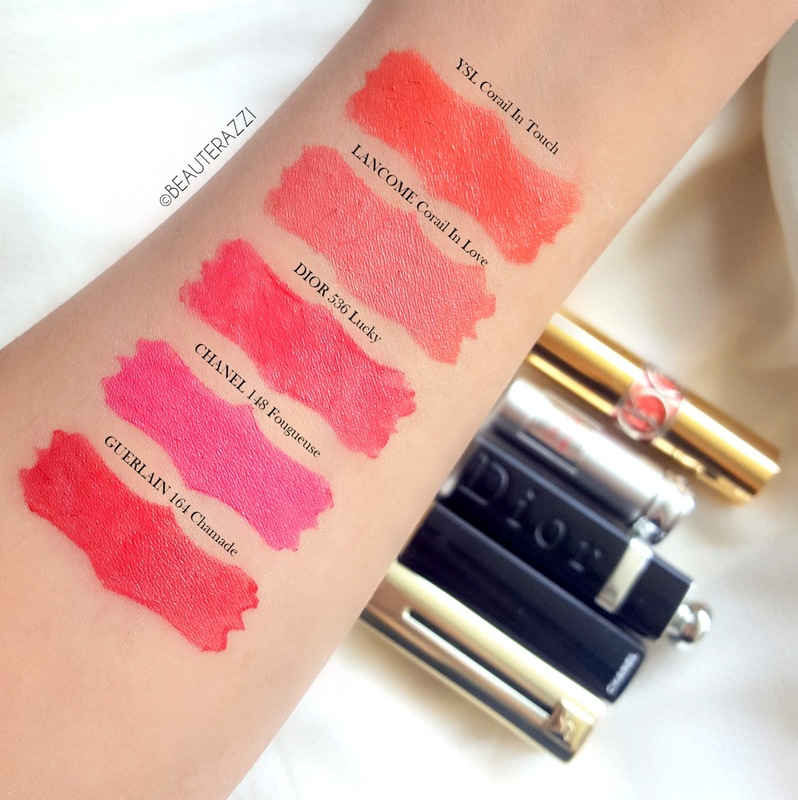 The formula is very juicy and pigmented. You can never go wrong with this lipstick. It just lifts up any look in a second and goes on so smooth. I am a sucker for Guerlain packaging. It's always so innovative. I love the twist-up mechanism of the Rouge Automatiques. Chamade is a reddish-pink with a beautiful glossy finish. I find the shade to be very classy and timeless. The hint of pink and red make it great for both daytime and nighttime. The coverage is also buildable. Although, unfortunately this lipstick is not available anymore. But you can check out their newest Rouge G Customizable Lip Bullet. This thing's next up on my wishlist! What is your holy grail from the luxury makeup?